What’s the trick to Uploading MikuMikuDance YouTube Videos? How do I create a YouTube account? How do I upload an MMD video to YouTube. Does MikuMikuDance upload to YouTube? In Miku Miku Dance, after I render to AVI, how do I upload my video to YouTube? Uploading MikuMikuDance YouTube Videos can be quite confusing. Making MMD videos is great fun, but once they are done and you want to share them, do you know what to do? Uploading videos to YouTube is not as hard as you think. In order to upload videos to YouTube, you are going to need a YouTube account, right? If you already have an account you can skip down to the next heading where we will go over how to upload, which settings you should use, and what information to give your viewers. The first step to creating an account is to go onto the site and click the ‘Sign In’ button, this will take you to where you need to sign in. You should see another button called ‘Create An Account’, this is the option we need. Click on this and it should take you to a new page where you simply enter your details, E.g. Username and Password. Since YouTube and Google are now connected, you can use your Gmail account to sign up, or within this sign up page, a new one will be created for you. Once you have entered your details press ‘Submit’ and you will be taken to the next page where you can upload a profile picture. You can then continue to YouTube. To change your channel name from your own name to something more MMD related, go onto your channel by clicking the small grey arrow in the top right-hand corner and press My Channel. An option will come up asking if you want to use the channel as [Your Name], click the option ‘Business or Other Name’ that is underneath. Follow the on-screen instruction and it will be done. 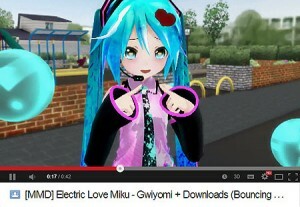 Uploading MikuMikuDance YouTube videos here we come! That’s right~ Now that we have set up our own YouTube account, we can then go ahead and upload our rendered video. If you need help in rendering a MMD video, take a look at FicticiousAnimation’s ‘Render you MMD Video in 1080p Using Windows Live Movie Maker‘ article for steps on how. Go to the top of your YouTube screen, you should see a small grey button that is named ‘Upload’. Simply click on this button and it will take you to the uploading screen. Before we move on, do you see the ‘Privacy:’ option? This gives you the option of how you want your video to be viewed once it is uploaded. The following option are: Public (All can see), Private (Only those with the link can see), Unlisted (Is public, but cannot be searched for using the YouTube or other search engine features) and Scheduled (Uploads but is only released to the public at a specific time). Now press on the uploading area, anywhere you click should make a new ‘OPEN’ window. Once it has popped up search through your documents to where your video has been saved and press ‘Open’. It will lead you to another page on YouTube where you can see your video being uploaded and processed. You can also simply drag your video onto the YouTube upload section for a quick way to start an upload. Note: Uploading even a small video can take a while. The longer the video, the longer it will take in order for YouTube to process and upload it for you. A Title – A no-brainer, right? All videos should have a title, or else who do people know what it is about? The title should include what is in your video, for example: You have a MMD video of Miku dancing to “World Is Mine”. The title should be something along the lines of [MMD] Hatsune Miku – World Is Mine. A very good title~ Be sure to include MMD or [MMD] in your title! Description – This is what many people lack, a good description. What should be put in a MMD video description? Maybe a small intro on what the video is, or why you made it? This makes the video more personal and friendly. To simply say, “I own nothing and all copyrights belong to their respective owners” is not enough. You should include what models, motion data, camera data and the effects you have used as well as who made them, this is giving credit as well as helping the viewers find out information on what you used. If you like you could even put in the download links too instead of who created them, this kills 2 birds with one stone. The information you put in your description is important and should be as accurate as possible before the upload finishes as it will help avoid any confusion. LearnMMD’s Reggie Dentmore often writes his video’s Description like it’s a magazine article so as to convey all of the excitement he enjoyed as he created his animation and video. Tags – Tags are used to help people find your video in the YouTube search feature. 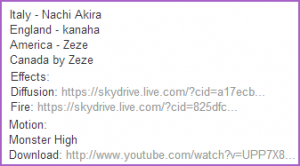 Tags are important if you want people to watch your video. You do want people to watch it, right? Good! What they do is they take the words or phrases entered and each time someone places those keywords into the search, it will list your video. The more tags, the better chance at your video being placed into the search results. BUT be careful as if you put tags that do not apply to your video, you can get a strike on your account. The basic tags you can use are: MMD, MikuMikuDance, (Model Name), (Motion/Song Name). Category – So… which category of YouTube does a MMD video belong? There is a very limited choice in which category you want to place your video into, but there is only really one that the whole of MMD can comfortably fit into. Entertainment. If you place your video into a different category then those who narrow down search results be category may miss your video as it will not be listed! Once you are done, simply press the ‘Save Setting’ button and presto! All that is left to do is wait until the video finishes uploading, sit back and watch as your videos get more views than they normally would. Remember these tips for the next time you upload a video and soon it will become natural for you to add in all of the needed information. If you would like to take a look at how I set out my MikuMikuDance YouTube videos, then click on the preview image and it will direct you to one of my recent videos which includes all the needed information.